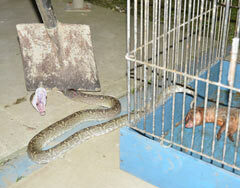 In the evening of April 22, a habu snake trying to swallow a mongoose was caught in the house of a local resident of Shimashi, Ginowan. In the night of April 22, Shincho Tawada, a 73-year-old resident of Shimashi, Ginowan, captured a venomous pit viper, which is also known in Okinawa as a habu. Tawada discovered the snake when it was in the act of swallowing a mongoose that he kept in a birdcage in his house. He grabbed the snake when it tried to slip away from the scene, vomiting up the mongoose as it went. On April 21, Tawada caught the mongoose, a natural enemy of these vipers, in his field in Nakagushiku Village. He set a trap after having been troubled by mongooses eating his chickens’ eggs. Tawada brought the mongoose into the house and put it in a birdcage to show it to his grandson who was interested in the animal. When he checked on the mongoose at around 9:00pm on April 22, he found that a pit viper had somehow got through the wire into the cage and was in the process of swallowing the mongoose.